Our health is the most important thing we have, and it is therefore necessary to turn as much attention to it as possible. The scientists have proved that the food we bring directly related to our health; so you should carefully choose what to eat. Thanks to the delicious cocktails of fruits and vegetables you give your body a vitamin boost which is really worth it. You will feel refreshed and at the same time enjoy it. You will get new energy and be refreshed with vitamins. The main advantage of juices is that they are easily digested by the human body. Our bodies can absorb more vitamins and useful elements from fresh juices than from eating solid foods. A small number of people could suddenly eat whole pineapple; 225ml of a pineapple juice is a better choice. Fruit and vegetable juices are also used to remedy disadvantages of modern cooking, and at the same time it is one of the most effective ways to prevent most illnesses. That day has come and you’ve decided to buy a juicer. You are sick of the juices from the store or you just decided to get some healthcare reforms into your daily life. Perhaps you have resolved to do a body cleansing with healthy juices? Or do you just want to have a juicer and sometimes have a fresh and healthy juice? Depending on your desire and ability you have several options to choose which juicer is best for you. The ideal juicer is one that meets your needs. There are 2 types of juice on the market: centrifugal juicer and masticating juicer. Juicers come in all shapes and sizes and use different methods for squeezing juices from fruits and vegetables. 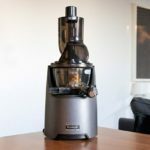 But given that their prices vary greatly it is worth knowing what you need to enjoy the best natural juices and what juicer features can make your life simpler. The money you are willing to spend on a juicer will probably also determine its kind. Centrifugal juicer is more popular and more accessible. Masticating juicers, also known as cold pressing juicers, are usually more expensive. Below we will explain the advantages and disadvantages of both types of juicers to help you decide which juicer is the best for you. Centrifugal juicer works by using a straight blade at the bottom of the mesh filter basket. Thanks to the centrifugal force, the juice from the chopped pieces then passes through small openings on the mesh filter basket. There are two types of centrifuge – a closed centrifuge, which must always be cleaned when filling with a pulp and an open centrifuge (pulp ejector) with continuous centrifuge, where the mesh is poured into the collecting container. Moreover, centrifugal juicer can be classified based on the size of the insertion hole – for the whole apple (7.5 to 8.5cm) and with a smaller insertion hole (for example, semicircular or some other shape). A larger opening does not necessarily have the advantage. The aperture size should be proportional to the engine power. Unfortunately, there are many manufacturers who do not understand this fact. Increasing the aperture size can significantly shorten the life of the engine or even lead to its burning. The mesh filter basket is large and hard to clean. Rotating knives must be cleaned and may be hazardous to handling. The centrifugal process and the high speed of rotation cause large amounts of air to oxidize the juice which then quickly gets brown and loses its nutritional value. The centrifugal process produces large amounts of foam (therefore most centrifugal juices have a foam separator as part of their basic characteristics). Leafy vegetables, wheat germ, wheat grass, grass and some fruits and vegetables can not be squeezed well with this method. Most centrifugal juicers are very noisy and are often limited to just a few minutes of work. The pulp is deposited in a mesh filter basket and the efficiency rapidly decreases when used over a long period of time (the mesh filter basket needs to be cleaned with the disinfectant once every 2 months). Most centrifuges have large insertion holes (for whole apples). – Warning: This is not always an advantage. Juice making using this method is faster than when using any other technology. Easy handling and compact design. Good usability of root vegetables and other hard fruits. Most centrifugal juicers rotate at a rate of 6000 to 12000 rpm. This is usually adjusted with two speeds – a lower speed of 6000 rpm and higher of 12000 rpm. The price of centrifugal juice ranges from 30 to 250 $ – therefore, what is the difference and what do you pay extra for? The cheapest centrifugal juicer is actually just toy with unusual small plastic joints and collection baskets. These appliances usually have weak engines, whose efficiency begins to decrease with greater effort, or in the worst case stops. Within a year, the appliance usually burns. At the end of most of the cheap centrifugal juicer, the owners refuse to make the juices and the appliance ends up collecting dust on the shelves – the effort to improve the health is getting worse. The best quality centrifugal juicer costs around 150 $ but this does not have to be a strict rule. The main difference is in the quality of the process and in the shape and size of the mesh filter basket which is usually made of stainless steel. There is also a more powerful engine (600-800W) which speed of rotation and usability do not diminish with greater effort. Centrifugal juicers of a better quality as a part of their basic characteristics usually have a juice collector with a foam separator and a cleaning brush. The last difference can be seen in the choice of used plastic (centrifugal juicers of poor quality are usually irreversibly colored after first use). 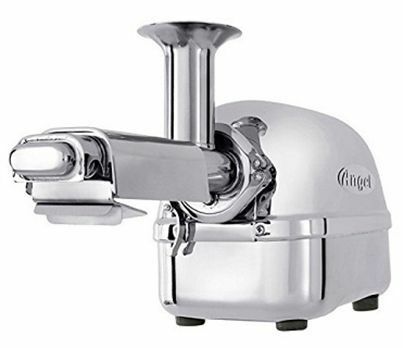 In addition to classic centrifugal juices Magimix Le Duo Plus XL also belongs to the category of centrifugal juicers. Magimix is ​​a special juicer as it has only 1500 rpm unlike classic at 6000-12000 rpm. With the slower rotation speed you will notice the difference in the quality of the juice. Juice made in Magimix has less foam and longer remains fresh. Magimix also gives a little more juice. The closed juicing system can absorb about 1.5-2 kg of fruit and vegetables which will give you about 1 liter of juice depending on which fruits and vegetables you are juicing. Magimix has another advantage compared to classic centrifugal juicers: it can effectively squeeze small berries or with a PLUS model to prepare dense mesh of any soft fruit. The revolution in juice extrusion occurred in the 1950s, when Plasta-ket invented a device called Champion Juicer, the first masticating juicer in the world. Champion Juicer is the only juicer that processes fruit and vegetables with rotary blades and is the only representative in this category. One of the good properties of Champion Juicer is unlimited running time. The engine has air cooling which allows the processing of large amount of fruits and vegetables. Its blade works at a speed of 1425 rpm. The Champion Juicer is one of the high-revolving appliances which causes the air to blow into the juice and creating a considerable amount of foam. Leafy vegetables can not be squeezed yet – long stems and leaves are often stuck in the blades! The only way to partially squeeze the leafy vegetables and grass is to cut it on small pieces and add it to ordinary fruits and vegetables (root vegetables, apples, etc.) Another problem is that during processing of large amounts of fruit and vegetables the engine and blade heat up. This heat is then transferred directly to the fruits and vegetables being processed (it is recommended that each individual portion is cooled in the refrigerator before use which will partially prevent the heat transfer on juice). So why Champion Juicer and what are its features? 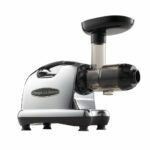 First and foremost, if you plan to scratch large amounts of hard root vegetables or apples, Champion Juicer is the right choice for you. The Champion Juicer has an insertion gap of 45mm which speeds up the preparation of fruits and vegetables as well as the squeezing of juice. Enzymes remain preserved in the juice. IMPORTANT – green juices are finally GREEN. Every time you take a glass of “live” juice. 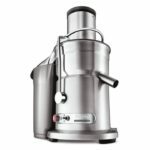 Some cold juicers are very easy to clean – you do not have to brush a rotating site or clean small blades. The rapid oxidation of apple juice is a good test for the vitality of juice. Other fruits and vegetables would have similar results in centrifugally dispersed juice but the typical feature is the amount of foam the appliance produces. Many prepared with the aid of the gear would always have little or no foam. For example, fresh orange juice from the centrifugal juice has a lot of foam, and when it is prepared in a masticating juicer the foam is almost not present at all. It is often said that juice made in a centrifugal juicer should be consumed immediately so as not to lose its nutritional value. This is only partially true – the nutritious value is not lost only by the aging of the juice but by the process itself. For the best quality, live, healthy juices, fruits and vegetables must be processed using a gear with a low speed that will not damage the fruits and vegetables with sharp blades. This is the best way to get plenty of nutrients found in fresh fruits and vegetables. No other home or commercial technology for the preparation of juice can provide an effective amount of live enzymes, vitamins, minerals and phytonutrients. Please bear in mind that despite the claims on the superiority of the enzyme content that produce different types of juicers there is currently no absolute test that can determine which specific device produces the most nutritious juice! Most of the technical material for a particular type of juicer claims that the most suitable and the best machine is the one that the vendor offers. Therefore, we do not recommend purchasing based on such material. Even the rewards some juicer get can not be taken seriously. In addition, there is no evidence that the difference in speed in this category has any the impact on juice quality (70 rpm is not better than 120 rpm). The truth is that juicer running at lower speeds has more advantages over centrifugal machines running at several thousand rpm because the quality of the juice is different. If quality is an important factor for you then the question remains – which one is better: a single gear juicer or a twin gear juicer? Juice filters are very different. One of the reasons for the difference is that Omega has patented its own filter system. The best results were obtained with two step juice filter. Juice filters used for Wildcat JX 100, Matstone 6-in-1 or Lequip Omni leave a small hole inside the mesh filter drum and can provide more mushy juice. Based on our experience one step filters for juice used for older Lequip models or for Compact Juicer usually provide a little lower utilization of fruits and vegetables. The main difference between a one step and two step filter for juice is that with a two step filter system you get more juice and juice that it is not so mushy. With some types of fruit the difference can be more than 20%! In a two step filters for the juice the first drops of juice come out immediately after putting fruit and vegetables into the insertion hole. The rest of the fruit and vegetables pass through the second stage of the filtering process. The second stage will squeeze the remaining juice from the fruit and vegetables. Conclusion: When you squeeze soft fruits or apples that are not so fresh and no longer crisp you may notice problems during squeezing. When the screen is blocked the gear will be blocked by turning into melted fruit or vegetables without squeezing the juice through the mesh filter. In this case you need to buy fresh apples or you must add some hard fruits like carrots to solve the problem of clogging. Apples that are not crunchy can cause thick juice. If clogging is caused with red / black currants it is recommended that stems also be juiced. 2 step squeezing systems have better performance and are not clogged because juices always have a way out. 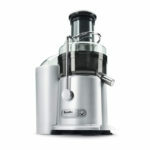 Currently, there are two two-step juicers with a single gear: Solo Star II and Omega 8004/8006. Both models are based on older models of the same appliance. With Omega 8004/8006 we have noticed a better performance when picking small fruits such as berries, currants, grapes and the like. The amount of juice is almost the same with really minimal differences. If you are looking for cheaper juicer and do not mind a small amount of juice and weaker materials you will be satisfied with a single-stage juicer with a single gear. If you want a better use of fruits and vegetables the better the materials used in juicer production you should use a two step juicer with a single gear. Based on our testing and experience with 1-stage juicer with single gear in this category we can recommend Matstone Deluxe, Matstone 6 in 1 or L’equip Omni. We have a poor experience with the Compact Juicer, since we have a lot of problems with the broken parts. We have also noticed a large number of reported cases of broken parts with Lequip Visor (old model). In a 2-stage single gear category we can recommend a very reliable and efficient Omega 8004/8006 juicer. Recently there have appeared vertical juicer with a single gear. You might be wondering what the difference is between the classic single gear and vertical juicer. Classic (horizontal) juicer with a single gear are known for slow work and small insertion holes. Sometimes it is necessary to press, for example, carrots, to squeeze in a classic single gear juicer. So the main differences between the classic (horizontal) and vertical juicer with a single gear are the following: the speed, the large aperture for insertion and the ease with which fruit and vegetables are placed in a juicer. The quality of the juice is the same, but you prepared it fast and with less effort thanks to the larger insertion hole. All fruits and vegetables are easily sucked into a juice piece per piece. The amount of juice obtained is almost the same or slightly different when compared to the Omega 8004/8006 or SoloStar II. What To Keep In Mind When Buying A Juicer? You know for yourself when you make the juice you want to emit any possible healthy drops of fruit and vegetables in your glass. Poor juicer will also do a bad job leaving you with less juice. Even if you have bought expensive, organic fruits in your desire to bring as many healthy nutrition into yourself, disappointment will be bigger because the money you invest is not fully utilized. A key role for the quantity of juice is the number of juice reels. The higher the number of rotations, the greater the centrifugal force that pushes the fruit towards the grinding net, and the amount of dried juice. The optimal number of turns per minute is 10,000 – 15,000. All the more is better, and below that, the worse. The number of revolutions is related to engine power and quality. Powerful, high quality motors allow for more rotations and longer lifespan of the device, while those with less power also provide less rotation. Most juicer has just one button, on-off switch on and off, without speed setting. The ability to adjust the speed is very useful if you like to make different juices and those with citrus and juices with hard fruits and vegetables, as well as exceptionally healthy juices of green leafy vegetables. Soft vegetables such as strawberries, peaches, grapes, etc. can go down at a slower pace, but for hard, roasted vegetables such as grain and blackberries, higher speeds are required. The ability to adjust food speed can affect the quality of the juice, and will certainly save you time and spare you nervousness. If you make a family juice, you do not want to interrupt in half, to empty the pulp container. So pay attention to the choice and look great enough for a couple of glasses of juice. Grid and all metal parts should be made of stainless steel, stainless steel. This is crucial primarily because of health security, and then due to the longevity of the appliance. If the grid of a matrix that can get through, you risk having a rash sometime after contact with the acids from the fruit and then the juicer becomes unusable. Juicers usually have 5 parts that needs to be cleaned and it is recommended to clean them immediately after use. Then it is very easy to remove all the residues just under the hot water jet. However, if you are not the type that is ready for cleaning immediately after using the juicer then choose the models with brushes that will help you clean the scrap of fruit and juice. Like all knives and gears, the juicer should be hard enough to stand stable on the kitchen table and have rubber feet that prevent the machine from moving over during operation. When we talk about the price, we are not talking about the price of the juicer itself, but its long-term profitability. Cheaper and faster centrifugal juicer creates higher costs over time because they fail to squeeze the fruits well, so you need more raw material for the same amount of juice. In addition, the more expensive juicer most often have a longer warranty. If you think the noise level that a juicer produces is not important, consider it again. You certainly do not want the making of your morning juice to awaken the rest of the family or neighborhood. You want a juicer who works quietly to maintain peace in your own home. Generally, cheaper and fast centrifugal juices are loudest, and those whose mechanisms are turning lightly are the toughest. With mastic juice, while scouring natural juice, you can continue to talk, watch and listen to the TV show and let your baby sleep. You certainly do not want your juicer to be too big and take too much space on the kitchen counter. But you do not want to be too small. The quantity of juice should be determined by the amount of juice you want to make and the amount of space you have for the kitchen. As far as the power itself is concerned, it is not related to the size. It should always have in mind that at least 400 watts are needed to squeeze juice from hard vegetables, berries or wheat. Of course, greater power implies a higher electricity bill, but it is worth it if you want to save on products in the long term and / or make more quality juices. As the name just says, a juicer is a much better choice for making natural juices. As the pulp separates them from juice, you get clearer and less dense juice than smoothie, as in the case of a blender. The juicer will extract juice and remove cellulose from fruit and vegetables. No alternatives are better than each other, the question is just what you need. If you are trying to lose weight, the juicer is a better choice. If you want to maintain your weight and healthy habits, there is no bad choice. So a good juicer needs to be made of high quality materials, have a powerful engine and a large number of rotations All other features, such as color and shape, are left to you. At the very end, the budget you are prepared to spend on the juicer is also important, since the cheapest will not always make you the happiest. Consider purchasing juicer as an investment that needs to meet your requirements for many years, so make a smart choice. Do you enjoy a refreshing cold drink? None of this if you toss fruits and vegetables at room temperature. You do not have to be afraid that the juice will be too cold if you use refrigerant foods because the juicing process of the juice process causes the juice to rise to at least five degrees. To extract as much juice from green vegetable leaves pluck them into the bowl before placing them in the juicer. In this way you will get more juice because the juicer will sqeeze vegetables, not just ‘air’. Never squeeze juice for ‘later’. It would be ideal to make just as much juice as you intend to drink in the next few hours. When you squeeze fruit or vegetables with a bitter taste like a kelp add some sauce and a piece of sweet fruit like an apple to make it more enjoyable.